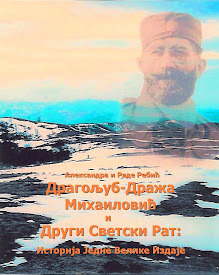 General Draža Mihailovich: General Mihailovich: A Serbian National Hero and Patriot who cared for American Troops like they were his own sons. General Mihailovich: A Serbian National Hero and Patriot who cared for American Troops like they were his own sons. I’m about to tell you a story that, after you’ve read it, if your blood isn’t boiling . . . well, you maybe ought to book an appointment with your favorite mortician. Armchair Generals in the Pentagon during WWII and their civilian counterparts and bosses in the US State Department should have been taken out and given, at a minimum, a sound caning or horse-whipping . . . and at the worst, faced a firing squad. Their absolute ineptitude and politicking almost cost the lives of 513 Allied airmen and, ultimately, ruined the reputation and resulted in the firing squad execution of a national hero and patriot who cared for our troops as though they were his own sons. Sadly, these idiots who ran the Pentagon are all gone now. We cannot give them the thrashing they so richly earned and deserved. Bumbling incompetents who were more suited to fighting a war on the Washington cocktail circuit than out in the boonies with the troops, they were pledged to supply, defend, and look after their interests. Instead, they survived the war in comfort while others, many others, suffered. This was the time when our aircrews were flying incredibly dangerous bombing missions over the Ploesti Oilfields in Romania. The Nazis surrounded these critically important oilfields with major defensive barriers . . . massive amounts of ack-ack (anti-aircraft artillery) that filled the air with flak, trying to bring down our bombers. And, too often, they were successful. If the bombers were not shot out of the sky they would limp along as far as they could before the air crew had to bail out. Often, this was over the hills of Yugoslavia. Upon landing, Serbian villagers would soon find them and rush to embrace the downed airman. Area Serb farmers and their heavy set wives, with their babushkas, and rough peasant clothing, would take them into their small villages and hide them from the patrolling Germans. They would feed the airmen stale bread and goats milk . . . sharing with the airmen the meager food supplies they had. This is a magnificent story of heroism, sacrifice, planning, execution, and accomplishment that remained a secret for over 50 years. It was kept a secret until 1997 because those same Armchair Generals and lily-livered bureaucrats at the State Department wanted it kept secret. Details of what happened might embarrass somebody . . . an ally, a former enemy, a present enemy, or, heaven forbid, themselves. Only recently has the story been totally declassified and that, in itself, is an absolute injustice and borders on being criminal. Bureaucrats showed what cowards they were, what treacherous administrators they were . . .that had no regard for 500+ airmen who had been hiding under Nazi noses for months. Instead, they chose to play politics . . . and politics, when it involves our military and their lives, is despicable. Sometimes I think if we could just get rid of the bureaucrats we’d get something done and win some wars. A reader of The Paper, and a nieghbor, brought me a copy of The Forgotten 500, by Gregory A. Freeman. It tells the story of Operation Halyard in August 1944 (suppressed for almost 53 years). 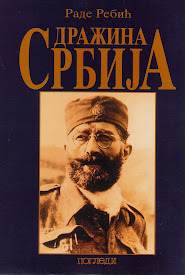 Five American agents from the OSS, the precursor of the CIA, worked with a Serbian guerilla, General Draza Mihailovich, to carry out the huge, ultra-secret rescue mission from the hills of Yugoslavia. 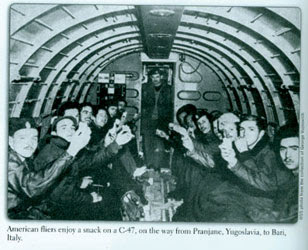 Americans would send in a fleet of C-47 cargo planes to land in the hills of Yugoslavia, behind enemy lines, to pluck out hundreds of airmen. In this remarkable mission, more than 500 Allied airmen, mostly Americans, were rescued from the hills of Yugoslavia. At the time, the area was controlled by the Nazis who were hunting for the American airmen daily. The story also involves a national hero who died needlessly, because our government did not support him . . . even though he took our downed airmen under his wing, protected them, saw to it they got fed, saw to it, eventually, that they were successfully evacuated from Yugoslavia and returned to their families. These brave Serbian villagers hid the Americans, even though they faced death if they were caught. It wasn’t a simple task. Not by a long shot. The number of downed airmen was enormous. 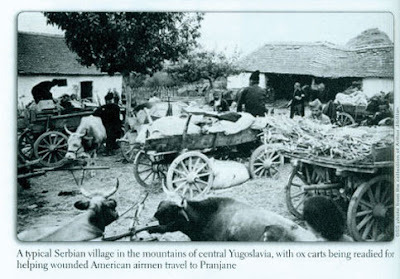 First, a hundred, then 150, then 200, ultimately, there were over 500 airmen who were being hidden in the Yugoslavian hills by these poor Serbian villagers. Some sad stories came about as the Serbs sought to comfort our airmen. On more than one occasion our airmen would be given stale bread and goats milk to eat . . . and they would wolf it down . . . only to then learn that the food they just ate had been meant for the airmen and the entire family. The family went without eating that night. On another occasion, a newly arrived airman awoke in the morning and complained about how hard his bed was Another airman who had been in the village for awhile took him by the collar and went outside and pointed at the villagers who had given up their bed for the comfort of the airman. They had slept outside, on the ground. The airman felt about an inch tall, but he also learned just how much these Serbian villagers were sacrificing to aid in the comfort of these airmen. Gen. Draza Mihailovich is one of the primary focal points of this story. 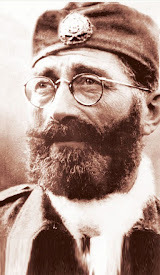 He was the leader of the Chetniks, the Yugoslav guerilla fighters that challenged the Nazis. 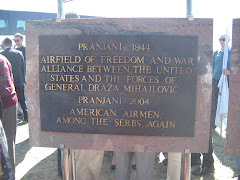 When the Allied airmen landed in the hills and forests of Serbia, they were now among freedom fighters, loyal above all else, to the democratic Allies, though the airmen did not know it as they fell from the sky onto Yugoslavian soil. Among the hundreds who fell, most were Americans. 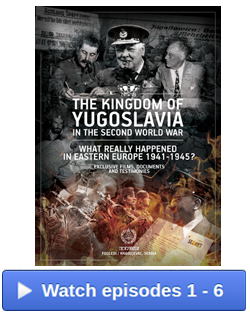 The other military and heavily political element in Yugoslavia was headed by Josef Broz Tito. 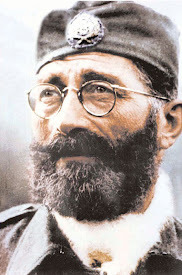 He organized the anti-fascist resistance movement known as the People's Liberation Movement led by Yugoslav Partisans. Ostensibly, both organizations, Mihailovich’s Chetniks and Tito’s Partisans were fighting the same war, to defeat the Germans. But, in fact there was a war within a war going on. 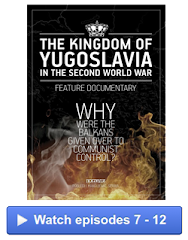 Tito was heavily supplied by Russia, was an avowed and avid Communist and was determined to turn Yugoslavia into a Communist state once the war was over. He worked closedly with British “moles” (spies who worked for Britain’s MI5 but who were secretly working for the Russians and the Communist Cause.). Mihailovich, on the other hand, sought a democratic Yugoslavia. 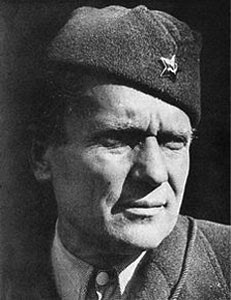 In the end, Tito prevailed and achieved his goal of converting Yugoslavia to the Socialist Federal Republic of Yugoslavia from 1945 until his death in 1980. General Mihailovich fell seventeen months after the so-called "liberation" of Yugoslavia. 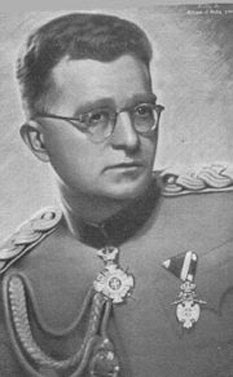 Reports from Belgrade on March 24th, 1946, announced his capture under puzzling circumstances on March 13th, 1946. 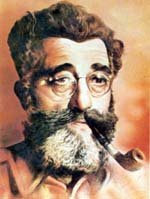 His trial before a Communist military court began on June 10th, 1946. He was "sentenced" to death on July 15th, 1946, and murdered on July 17th, 1946. General Mihailovich is no more. He has departed this world convinced that he was abandoned by the Allies. The voices that were raised abroad in his defense were not allowed to reach him and he died without the satisfaction of knowing that in the opinion of many he died an innocent man and a great soldier. 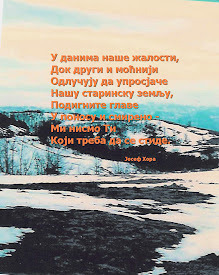 The legends of his heroic deeds, however, are becoming more and more well known, certainly in Yugoslavia, and, finally, now in the western world. 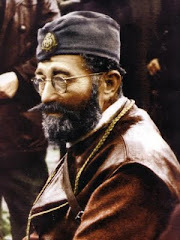 It is safe to say that he, Mihailovich, lives in the hearts of the Serbs of Yugoslavia. Ultimately, General Mihailovich and his forces would prove just how profound ‘doing the right thing no matter what’ is. Mihailovich, together with the Serbian people, had rescued, fed, clothed, protected and risked their lives on behalf of the Americans. These shot down airmen were "funneled" to the Halyard Mission which set up airfields for airlifting the fliers back to Italy. Those 513 rescued airmen have been pleading, shouting, and using any means at their disposal to right a terrible wrong. Mihailovich was labeled a traitor and collaborator and they have been, collectivly, trying for over 60 years to clear his name. Now, with the publication of The Forgotten 500, perhaps Mihailovich will receive his rightful, though posthumous, recognition for the good that he did, for his nation, and for our Allied airmen. The frustrating issue in this story is that in the name of political expediency, enforced by both the Yugoslav postwar regime and the British, the Americans stayed silent about this chapter of the great heroism of their own sons and the selfless sacrifices of their rescuers. Not only did they stay silent, they kept it silent. Classified. This story has never been appropriately publicized in the western world because it has not been “politically correct” to do so. 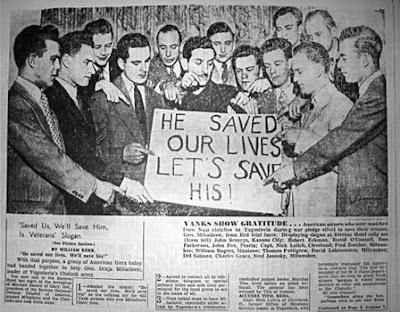 It has remained a taboo theme in many political and publishing circles which has dismayed and frustrated so many rescued airmen, and their rescuers, for decades. Many of the veterans of ‘Operation Halyard,’ both the rescued and their rescuers, spent the duration of their postwar years striving to right this wrong. Many have since passed away without ever experiencing the contentment of seeing justice done and a debt repaid. It was Deakin who was mainly responsible for convincing Churchill to switch sides from Mihailovich to Tito. Freeman competently weaves politics and the story on the ground together in such a way as to give the reader the big picture. Freeman, unlike many historians, is able to see the forest, not just the trees. He understood, too, the significance of Mihailovich’s integrity in rising above and beyond the betrayal perpetrated upon him and his people. In the summer of 1944, because of destructive but successful British political manipulations, it was no longer ‘politically correct’ for the Allies, including the Americans who deferred to the British in policy relating to the Balkan sphere, to deal with Mihailovich in any way. This means no supplies, food, ammuntion, or medical supplies. 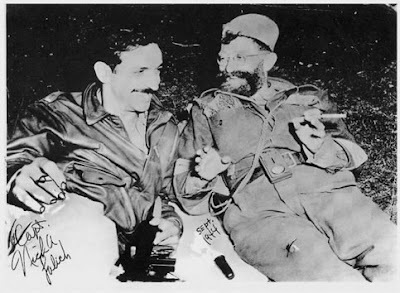 Yet, there were now hundreds of downed Allied fliers, most of them Americans, who were being protected by Mihailovich and his men and had to be evacuated. This presented quite a political dilemma. 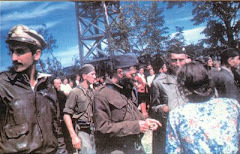 Thanks to the efforts of American officers such as George Vujnovich and George Musulin, an ACRU organization (Air Crew Rescue Unit) was created and it was decided to send Musulin to the hills of Serbia, accompanied by Mike Rajachich and OSS radio operator Arthur Jibilian, to run the evacuation operation that would come to be known as the ‘Halyard Mission’. It was going to be a rescue attempt unlike any ever attempted by the OSS or anyone else, and indeed that’s exactly what it turned out to be. Over the course of several months in 1944, hundreds of Allied airmen would be evacuated and not one would be sacrificed. All, without exception, would make it back to their homes and their families alive. Not one American would be turned over to the Nazis, even though the Germans were offering substantial rewards to the local natives to give them up. Though the Allies had turned their back on General Mihailovich, he refused to turn his back on them. 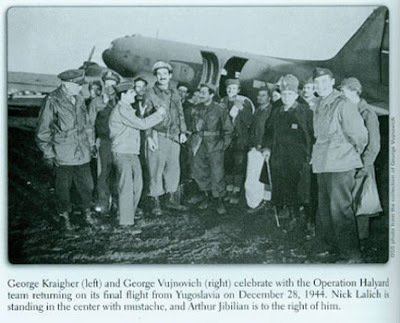 The drama of ‘Operation Halyard’ would end in December of 1944, and due to the perseverance of men with the names of Vujnovich, Musulin, Petrovich, Rajachich, Lalich, Jibilian and others, it would end as a virtually perfect success story in the face of almost insurmountable odds. 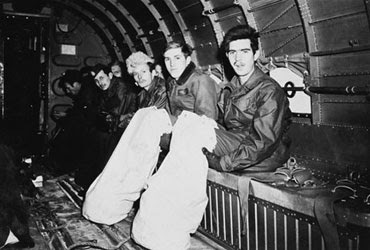 Allied airmen heading home; they had left their shoes and boots behind for the Serbs, who had poor footwear. Here, they use canvas bags to try and keep their feet warm. 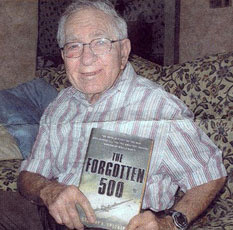 The last surviving American Hero from WWII and a member of the OSS team that brought back the "Forgotten 500," Art Jibilian, received a special Congressional Award on December 7, 2008 in Toledo, Ohio. Mr. Jibilian played a vital role in the operation, volunteering to parachute behind enemy lines and coordinate the rescue. He helped build a crudely constructed airfield that was cleared on top of a hill in the Village of Pranjani, Serbia, a plateau 55 miles south of Belgrade. The mission was coordinated by the Americans, British and Serbians. He and his team organized the villagers and the downed airmen, and brought the C-47's into the makeshift airstrip from which the airmen were rescued. Jibilian said even after so many years, he can't believe how hard his job was. But it was worth it. "When I look back on it, I'm amazed at what we have accomplished because we did this all under the Germans' noses," he said. "But we made it, and that's all that counts." “I had the privilege of spending six months with Cica Draja and participating in the rescue of these airmen. I cannot begin to thank the Serbs for the care given our boys. 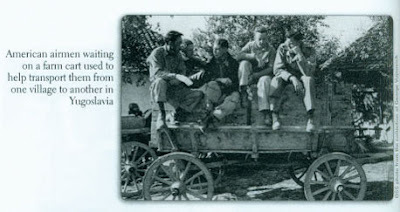 The Serbs hid our boys from the Germans, guiding them from village to village, until they were in the hands of the members of the Halyard Mission. They were then flown back to Italy and lived to get back to their families and loved ones. that parachuted in and arranged for the rescue 513 Allied Airmen. America owes a great big debt of gratitude to the Serbs. On behalf of the American people and the rescued airmen, I extend kudos, gracias, fallah, and thank you to the Serbian people." “The Forgotten 500” by Gregory A. Freeman, available at most major bookstores. Also, see http://gregoryafreeman.com/ and Amazon.com and other book distributors on the web. Webmasters note: Arthur "Jibby" Jibilian, now "living" with leukemia, remains active in "fighting for the cause" of making the Halyard Mission rescue operation known and appreciated far and wide. He was, and remains, a tireless warrior for The Truth. I am priviliged and honored to call him my friend. You may already be aware of this but I will tell you anyway and thank you for this tribute. I am humbled by the sacrifices of nameless peasants. I am in tears over it.